Last week, we reported that Disney has given a fall 2018 release date for their live-action remake of Mulan, with the studio putting it on the fast track to production. Earlier today, a report surfaced that the original spec script Disney purchased, written by Lauren Hynek and Elizabeth Martin, centers on a "30-something European trader who initially cares only for the pleasure of women and money," who becomes Mulan's love interest. Just hours after that report surfaced, Disney shot down those rumors, confirming that all of the primary roles in this remake will be Chinese characters. Here's what a Disney rep had to say. 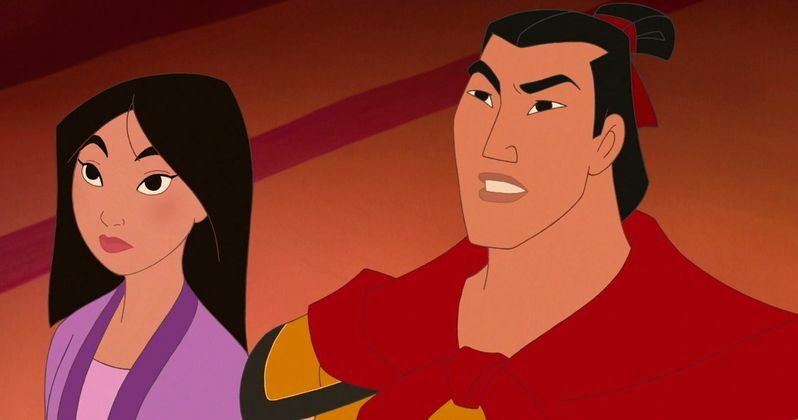 "The spec script was a jumping-off point for a new take on the story that draws from both the literary ballad of Mulan and Disney's 1998 animated film. Mulan is and will always be the lead character in the story, and all primary roles, including the love interest, are Chinese." Vulture released the statement from this Disney rep. The initial report first surfaced at a blog known as Angry Asian Man, which was written by a mystery author dubbed "ConcernedForMulan," who had reportedly read the original script by Lauren Hynek and Elizabeth Martin. The report was corroborated by actor Joel de la Fuente (The Man in the High Castle), who confirmed everything this author stated about the draft, as news of this potential "whitewashing" spread throughout the day. It's worth noting that our report from last week also revealed that writers Rick Jaffa and Amanda Silver (Dawn of the Planet of the Apes) came on to rewrite the original spec script for this live action remake. Given the Disney rep's statement, it seems that quite a lot will change from the original script, which reportedly has more than half its page count devoted to the white merchant who "develops a mutual attraction with Mulan and fights to protect her in the ensuing battles. To top it all off, this man gets the honor of defeating the primary enemy of China, not Mulan." Disney is set to launch a global casting search for a Chinese actress to play Mulan. Disney is hoping to start production late next year, although an official shooting schedule has yet to be confirmed. Hopefully we'll have details about the casting search for this upcoming 3D movie soon.